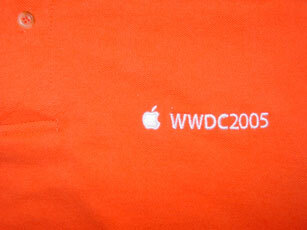 This was for WWDC 2004. 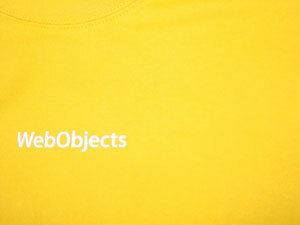 And no, I don’t work on the WebObjects team. When I first created this blog, I didn’t work for Apple, and Mac OS X 10.4’s codename, “Tiger,” hadn’t yet been announced. So when it was, I prided myself on being ahead of the curve. Perhaps…evening inventing the curve? Apple even borrows my blog background for such important things as its engineering shirt color. Next thing you know, they’ll have an application called “Help”…. There’s been a lot of press recently about Apple announcing a switch to Intel chips at WWDC tomorrow. Update: Problems with the link, so here’s another link. I wasn’t supposed to make this public, but…I can’t help myself. It’s just too exciting. The rumor about a headless iMac are in the right ballpark, but they go in the wrong direction. Instead of a headless iMac, what Apple will announce at MacWorld San Francisco in a few days is a two-headed iMac. It will be called the iMac Zaphod Beeblebrox Special Edition, and instead of the normal iMac silver and white colors, it will be black with green trim. It will be bundled with all seven Audible.com Hitchhiker’s Guide to the Galaxy titles, the Hitchhiker’s Guide to the Galaxy text adventure game from Infocom, and two tickets to the Hitchhiker’s Guide to the Galaxy upcoming movie. Oh, and they got the price wrong, too. Instead of retailing for five hundred dollars, this special computer will sell for five thousand dollars. I can’t guarantee I have this completely correct, but from what I hear, they figured that anyone who is excited by the above specifications is probably not from this planet anyway, and would be a bit fuzzy on the earthly exchange rate.